With its warm neutral tones, the Chidi bed catches the eye with its unique single piece platform and headboard. The canopy above creates an intimate setting for those hot summer nights. A hand-carved and warmly aged Senufo day bed sits at the foot of the bed, while a bronze and wood Hagenauer inspired head sculpture finds pride of place at the bedside. Also available is a set of tea lights in carved wood bowls, a framed fabric motif, and straw pendant lamps. The Chidi bed pillows and throw each have six texture change options to create your own look. 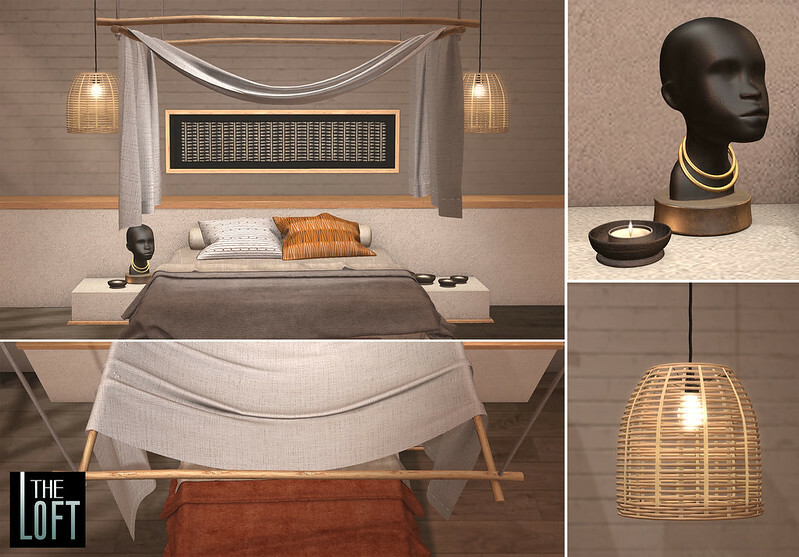 The Chidi bed is Available in PG and Adult options, each packed full of single and couples animations, while the bench comes with single and group poses. Come down to Uber before June 23rd to pick up this set!